I do love the luxurious, cultural experience a European river cruise offers, and I simply must share what I’ve learned about France Cruises, a world-leading luxury barge cruise company. Life in the countryside moves a little bit slower, and that’s the enchanting beauty of it. Here is where you’ll find the very heart and soul of Europe – far away from the hustle and bustle of city life. The luxury barge cruising experience is unlike any cruise you’ve taken. It’s about gazing at unspoiled scenery around every bend. It’s about getting to know the way of life of locals up-close. It’s about exploring off-the-beaten track areas along the inland waterways. But most of all, it’s a chance to uncover the treasures of the countryside in a relaxing, stress-free environment. For those seeking a personalized and enriching travel experience, authenticity, fine dining and a total immersion into the local life of the destination at a leisurely pace, barging is the ideal way to discover the essence of Europe without the strains of packing and unpacking. I was lucky enough to speak with Jean-Francois Dabrowski, president of France Cruises, about their portfolio of over 50 luxury hotel barges which voyage through seven countries including France, Holland, Scotland, England, Belgium, Ireland and Italy. But what exactly is hotel barging? One of the fastest growing segments of cruising is canal and river barging by hotel barges. Europe is laced with a network of canals that once served to connect the country’s main waterways and aid in the transportation of goods. Passengers onboard are afforded the opportunity to admire breathtaking scenery, explore historic towns and villages, and savor regional gastronomic cuisine and fine wine. Cruises are generally 7 days and 6 nights, and are all-inclusive. Pricing includes everything to make for a pleasurable holiday, from well-appointed accommodations and daily gourmet meals with wine prepared by the onboard chef, to guided excursions and admittance to cultural and historical sites and use of barge facilities such as bicycles and a Jacuzzi. Transfers and bar drinks are even included on the majority of barges. What’s the difference between hotel barge cruises and river cruises? Hotel barges operate at a much slower, gentler pace than most cruises. The essence of barging isn’t about covering long distances, but rather enjoying a relaxing way of life, soaking up the beauty of the countryside around every corner. In fact the vessel drifts so slowly, passengers can disembark and walk alongside the barge, meeting the boat at the next lock. As an advantage, one has the chance to delight in canal-side activities such as towpath jogging or cycling through nearby picturesque villages. Canal cruises have a great deal of flexibility. Itineraries are carefully-crafted in a more personalized manner to match the interests of the passengers, as opposed to traditional cruises that usually follow a fixed schedule with fixed moorings. This includes offering special theme cruises that tailor to the unique interest of the traveler. 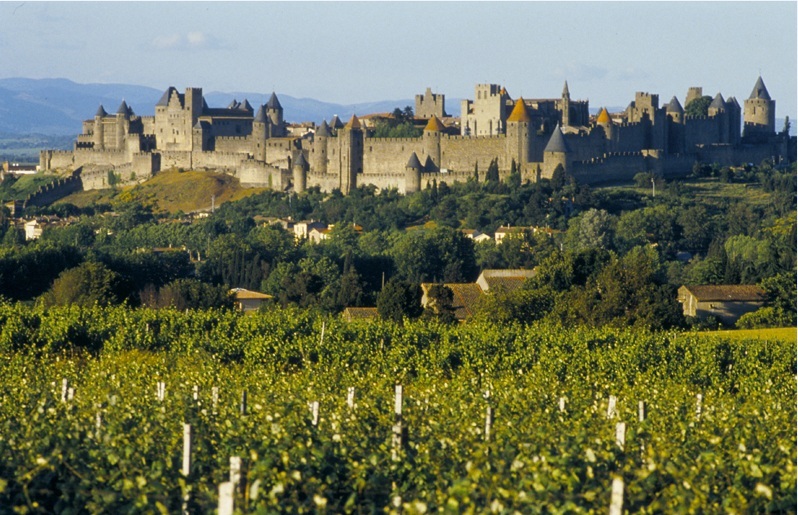 For example, wine connoisseurs can sample world-renowned vintages like Grand Crus of Burgundy during private tastings at local ch├óteaux’s in a “Wine Cruise,” while active folk can enjoy riding along scenic roads in Provence on a “Bicycling Cruise.” Moreover, barges come in many styles and levels of luxury to suit all types of travelers. Cruisers can choose between the casual floating B&B to the ultra-deluxe palace. But rest assured: both deliver the authentic barging experience. Can you walk me through a typical hotel barge cruise? Relaxed and informal, the casual style encourages congeniality between guests and crew alike – 4 or 5 will be along to attend to our needs. We can chat with the chef about the regional cuisine, or learn a few navigation techniques from the barge Captain. Part of the charm of barging, of course, is the camaraderie that develops while sailing with such a close-knit group. While we’ll admire the delights of the passing countryside from an outdoor sundeck, there’s also a dining room where we all take our meals together. The focal point of the group, this common area is where we might gather together after dinner, relax with a glass of wine, and share our days’ experiences before retiring for the night in our private cabins below deck. The barge is furnished with every modern comfort including central heating and air conditioning (for most of the vessels), and features fine wood paneling, carpeting and a blend of antique and traditional d├®cor. Accommodations range from charming twin and double-bedded staterooms to suites with sitting area – all with opening windows, closet, drawer storage and private en-suite bathroom. While on board, you may choose to relax on deck with a book, or listen to your favorite music in the saloon as your floating hotel winds along the gentle waters, unfolding a new picture of fascinating villages, majestic castles, rolling vineyards, lush forests and pastoral farmlands. There is something incredibly relaxing about traveling on water, along a small waterway, in a region just waiting to be discovered. The finest regional cuisine is prepared by your on-board master chef, complemented by a wide array of fine regional wines and an open bar. And, of course, the experienced and knowledgeable crew is there to attend to your slightest need. Or you can opt to embark on a culinary adventure with a visit to a fantastic restaurant onshore. Just steps away your barge, you’ll find a rich tapestry of culinary experiences -from traditional cuisine to high-quality gastronomic eateries – to suit every palate. Your on-board chef is an experienced culinary artist, whose gastronomic creations are often rated higher than top restaurants by our discerning clients. 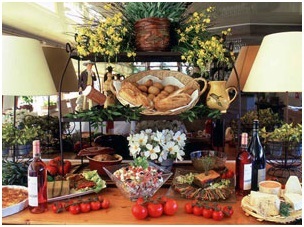 Lunch will be a colorful arrangement of salads, pates, savory quiches and a selection of cheeses. Accompanied by an excellent choice from the barge cellar, lunch is often enjoyed on the sun-deck, perhaps while cruising. Your chef supplements the vessel’s larder with fresh produce bought from local markets and creates mouthwatering regional and national dishes which are only challenged in flavor by the delicious range of regional wines we serve you aboard. Dinner is the culinary highlight of each day. Served by candlelight, each course is a delicious creation, subtly complemented with fine wines and still and sparkling water. This really does feel like the grand finale to an amazing day of exploration. Alternatively, guests can also savor the flavors of the region at local dining establishments. Many of our barges now offer “dine-around” experiences – dining ashore at carefully-chosen, authentic local French restaurants. Guests can get a feel of genuine French dining by interacting with the locals. Could you describe a typical menu? Awake each morning to the aroma of brewing coffee. Enjoy a continental breakfast of freshly squeezed juices, hot buttery croissants, crispy breads and delicious pastries; or a hearty cooked breakfast. Are epicurean buffets, delicious green feast salads, pates and cold meat platters, accompanied by a hot soup or entr├®e, delectable desserts and a selection of regional cheeses and wines. Served al fresco on the sunlit deck whilst cruising amidst en ever changing scenery. Profiteroles a la Cr├¿me, Glace au Chocolat Chaud-each course accompanied by a fine wine. And, of course, coffee and liqueurs in the company of fellow passengers completes the menu. What are the excursions ashore like? You are met at the hotel or pick-up point by either the Captain or our guide and escorted to your home for the week. Once aboard, our English speaking crew will show you your comfortable stateroom, which has full en-suite facilities. We usually cruise on the first evening and immediately the fascinating world of barge cruising begins to unfold. Barging provides us with ample opportunities for explorations by land – during events like wine tastings, market visits, and a home-hosted experience. Each day, our small group will venture off with our on-board guide/driver to explore historic towns, or to discover a quaint waterside village that isn’t even listed in the guidebooks. Often, after a few hours of relaxing cruising, we might just step directly off our barge, walk into town, and begin a two – or three-mile walking tour of a picturesque local village. While we’re moored, we have other opportunities for exploration. In France, historic towpaths alongside many of the canals provide the perfect opportunity for a leisurely walk or a more exhilarating bicycle ride (available on each barge). And in the evenings, when we’re moored, why not venture out for a stroll into a quiet waterside village or enjoy a pleasant bike ride in the cool evening air? You can rest assured that our meticulously planned itineraries include a host of pleasurable little side trips which show you the most delightful highlights of the area you have chosen to cruise. You’ll explore ancient castles, picture-book villages and stately homes. Wander fascinating museums, take part in private wine tastings at renowned and lesser known vineyards and shop in colorful open-air markets. There is plenty of time to browse tiny shops of skilled craftsmen, wander along enjoying the special atmosphere of the moment or shop for that gift which typifies the region in which you are traveling. We also offer hot-air ballooning as an exciting option. Ballooning generally takes place in the early hours just after dawn or before sunset, when the air is still and the light is perfect for drifting gently along and gazing down on the beautiful countryside below. Moreover, as an added benefit for our travelers, we offer an extraordinary range of unique and authentic tours and packages across the regions of France via our sister website, www.francecountrytours.com. As an optional add-on to our cruises, we offer hotel packages and custom designed tour itineraries to meet your specific needs. Could you walk me through a day in the life on a hotel barge? Wake up and draw the curtains to see the sun breaking through the morning mist over the canal. Take a delightful breakfast of coffee, croissants, and fresh fruit on the sun deck. Bike along the shady canal towpath. Pedal into a village to watch the morning hustle. Meet the barge at the next lock and reboard. Tour a centuries-old winery and taste the fruits of the vintner’s labor in his private cellar. Indulge in a three-course lunch prepared by the barge’s own French chef. Time for more fine regional wine and a delectable selection of local cheeses. You will sample 22 wines this week. Drive to an enchanting ch├óteau. En route, your guide fills you in on the local history. At the castle, enjoy a special-access private tour and time to wander the grounds. See the region from a new point of view as you glide over the French countryside in a hot-air balloon. Return to the barge just in time for aperitifs on the sun deck. Join your fellow passengers for an elegant five course dinner. Begin with exquisite hors d’oeuvres, a delicate soup, and a masterpiece of a main course. Then linger over a traditional cheese complete with a retelling of the legends that surround nearly all French cheeses. Regional wines are interwoven with each course, giving you a new understanding of the art of pairing wine and food. Finish off with a dessert nearly too lovely to eat. Savor a cognac on deck as the sun sets behind the lovely medieval village where you moor for the night. Wander off the barge for an evening stroll through the village, pausing for a nightcap at a local caf├®. Does your perfect day involve whiling away the hours with a good book? Strolling along the canal with your loved one? Napping in the sun? A ten-mile morning run? No matter how you envision passing the time, chances are you can make it happen on your very own personalized barge vacation. For more information, or to get a quote on the France Cruises collection of hotel barges please click here.